Professional Home Inspection Institute offers courses in environmental hazard training in subject areas like mold, asbestos, lead, formaldehyde, and radon. This website offers online courses for home inspectors to learn more about environmental hazards and how they pertain to home inspectors, mold inspectors, and radon measurement professionals. All the environmental inspection courses on this website have been developed by the Professional Home Inspection Institute and Professional Mold Inspection Institute. 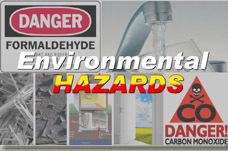 LearnEnvironmentalHazards.com is an authorized affiliate website of PHII and PMII. All the courses offered on this website are interactive and offer you the option of taking the courses online using your normal web browser. Some of the courses also feature cd-rom versions of the course so you can take the course even when you're not connected to the internet.